2017 is nearly here and working on your organization’s energy management plan is key to making sure you reduce consumption and emissions this year. Planning can take time and effort, but is well worth your time. When done properly you will set your organization on the right course to achieving your energy management goals this year. Energy management is a complex activity that involves taking action from the plantroom to the boardroom. Energy mangers need to understand technology, budgets, finance, planning and strategy in addition to emissions targets, corporate social responsibility and financial reporting. Relevant: The plan must focus on areas that are directly applicable to the kind of organization you work in. Realistic: The plan needs to be achievable with the resources and capabilities you have in place. Useable: To be of any benefit at all, the plan must be a useful document that can guide your actions day to day. A good energy management plan is like a map, helping you show people in your organisation where you are heading and the best way to get there. That’s why we created this comprehensive guide with free templates to get you up and running for 2017. It contains everything you need to create an annual energy management plan including checklists and questionnaires to get started. Around 14GW of new nuclear generating capacity may be built between now and 2035. The UK government has confirmed 8 sites where new nuclear power stations can be built. The new nuclear stations will take ten years at least to build and start operating from the mid 2020s. 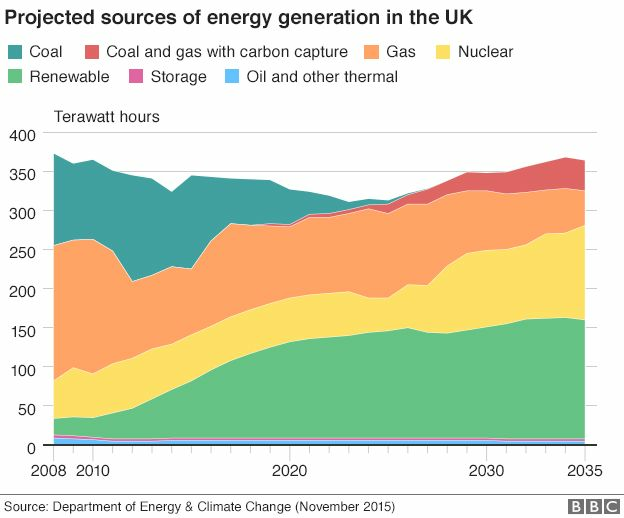 By 2035, over 70% of the UK’s energy is expected to come from renewable and nuclear generation. This image from NASA has been put together from over 400 satellite images and shows the Earth at night. It’s one of my favourite pictures – because it tells you something about the world that you know instantly is true. You can’t fake where the lights are. The satellites are taking pictures of where there is light, and you see darkness where there is none. We are surrounded by data. We use this data to make inferences and come to views on what is going on in the world. We use GDP to figure out which countries are doing well and which ones are doing badly. We use international trade to talk about which counties have the most economic power. We talk about human rights, standards of living and happiness indices to demonstrate our support for countries and their policies. All these things are conclusions and opinions we come to based on what we read and the data we select to support our conclusions. What I like about this picture is that you can use it to sense check your conclusions. For example, take this image from Freedom House that shows a map of freedom in the world, from where people are least free to most free. The parts of the map in green are the most free – and make up most of the world’s main democracies. You may disagree with the map and its makers, but I think you will see something quite interesting when you compare this map and NASA’s image. Countries that are free tend to have the lights on.